From the relevant state ministries and commissions, calligraphers, artists, celebrities and people from the motherland earth, friends from all sides of nearly two hundred people, with calligraphy and dance have a joyous gathering, in the form of nineteen together to celebrate the success of the nineteen meeting and expressed a positive spirit of the party's indentation forget the beginning of the heart, remember our mission "make greater contribution. The event by the China aging Development Foundation organized day fund, Chinese enjoy poetry painting and Calligraphy Association, CCTV channel painting and Calligraphy Institute and other units of the organization, the activities supported by experts and scholars of Management Services Committee painting and Calligraphy Institute, as collectors of art appraisal center and other units. At the meeting the leaders and guests: Director of the State Administration of cultural heritage, the former vice president Yan Zhentang Chinese Collectors Association; vice chairman of the CPPCC National Committee Secretary Sun Fuling, former director of the general office of the CPPCC Guangzhou military region soldier Guo Xinli; opera, the former head of the national first level actor Zhang Baosheng; the original CCTV Avenue founder, famous host Kang Jian; director of Xinhua News Agency reporter Zhang Ming Chinese zinc; Cultural Heritage Protection Research Institute Secretary General Gao Jian; executive vice president, Chinese poetry calligraphy painting and Calligraphy Association executive director of CCTV channel director Fan Mingji, Kang Lianghe; CCTV Book Law Report workstation of Tongzhou Zhanfuzhanchang Zhao Chuanhua; as the executive director of the center for the identification of art collectors, wood identification division Wang Lianqin, participants and speakers. And to the motherland from all sides of enterprise such as friends on behalf of the general manager Victor Fu (Shenzhen) import and export trade limited company LITE-ON, Zheng Jing Wong; Liu Chuantao planting cooperatives Wuchang extraction Wo rice; general manager of Guizhou ancient altar tension Wine Co. Ltd.; Guangdong Kaiping Goodwear Sanitary Ware Co. Ltd. Beijing general Manager Lin Jiebin; check and Tea Co. Yang Wenqian; Guangdong living water health industry development limited company general manager Wang Shu and other units to participate in activities. 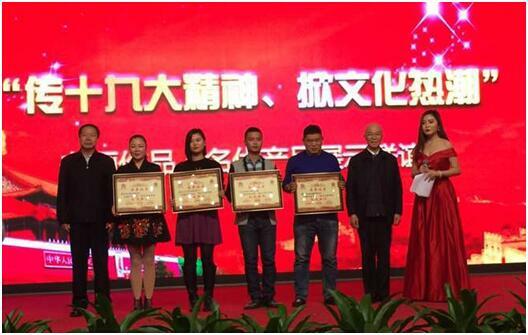 Based on the contribution of the above units to the cultural industry, the conference gave them the award of "the advanced units and individual awards for the promotion of the traditional culture and the enthusiasm of the public welfare undertakings." They stated that they should actively respond to the nineteen major calls and strive to do all the work and strive for greater achievements. China spirit, cultural development, a riot of colour, art shine. During the event to the artists active stage show art of calligraphy and painting style, a famous painter and sculptor, Xiao Bai famous painter painting wide, Beijing rain teacher made poetry and painting exhibition and performance poetry; military famous painter, vice president of China poetry painting and Calligraphy Association Wei Zuoqing also showed "Hu Yangsong" a Chinese poem painting works; painting and Calligraphy Association Gao Wenqing; CCTV channel calligraphy vice president Mei Yunduan, Wang Daojin also show their giant calligraphy. The book, the Chinese splendid culture painted the motherland beautiful rivers and mountains of a country. Kang Mingyi, Li Qiuping, the famous painting of Guo Yinliang, Zhao Qingfang, Li Jijun, Wu Laizheng, Guo Zhengmin, Ma Changsen, Xiong Hua and Li Shangyong, Chen Chi, Li Xuehong, Zhang Xiangqun, Guo Yinliang, Li Jingyue, Zheng Jinchun and other hundreds of artists also show their debut with his own feelings of writing - painting works of calligraphy and painting, expression of the motherland respect and love for life. 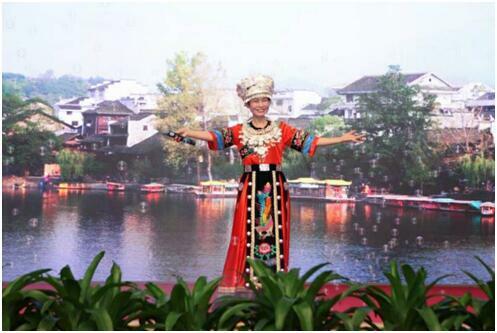 The activities in a warm and peaceful atmosphere of 81, national level actors, medal of honor, singer Zhang Baosheng and known as the Tujia folk singer Luo Aying lark young artists singing on stage, the general assembly to a climax, this event is closely linked to the theme from the spirit of nineteen, set off an upsurge in culture "that is another cultural event in the history of poetry and painting industry Chinese. 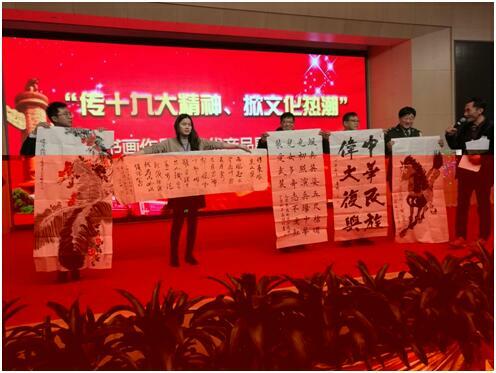 This event was carefully organized by Kang Lianghe, the famous planner of CCTV and the standing vice president of the Chinese poetry and Calligraphy Association. In the course of the event, there were several media reports on the scene.